Don't let your stock air box hold your vehicle's performance back. 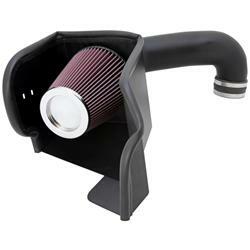 The experts at Trick Flow® have engineered TFX™ cold air intake kits to meet the intake airflow demands of your fuel injected ride. The kits replace your restrictive air cleaner with a low-restriction reusable filter, a tuned molded black plenum (where applicable), mounting hardware, and instructions. They are manufactured by K&N for Trick Flow®.